So, finally, as promised, here it is. Everyone knows the story of dashing Count Ronjon and Sæspeira, the fabled Esprit de Mer, the Spirit of the Sea; how Sæspeira was stolen from Ronjon and he was banished and declared outlaw, only to be recalled by the very queen who had stolen the treasure and banished him when Sæspeira was “lost” several years later. There began Ronjon’s romantic search for Sæspeira. Few people know, however, the story of Sæspeira and its journey outside of Ronjon’s possession. It is a tale of fragments, of the flash of the sun on choppy waters, now you see it, now you don’t. Certainly most of it remains a mystery, like the sea itself. But there are snippets, a sighting here, a rumor there, a hushed whisper, or a boast. It would be hard to accurately ascertain the validity and verity of these, but some do lend more credence than others. And some are simply too incredible to be anything but fact, for no man has that breadth of imagination or propensity for lying. This particular fragment of Sæspeira’s tale starts with a boy who was not quite a young man named Damian Cooke. Nothing much can be said about him, except he was an exceptionally ordinary boy. Two arms, two legs (though he did almost lose one), two eyes, a nose, a mouth. The son of a fisherman, Damian had worked on the docks and smelled like salt and seaweed ever since he could walk, and had grown up with sailors’ chanteys for lullabies. Around the age of fifteen, somehow or another Damian got it into his young, brash head it would be a good idea to stow away on a ship and have an adventure. With complete confidence in his ability to talk or charm his way out of just about anything, he found a likely candidate: an old snow with faded purple sails, flying neutral colors, with the words Dark Swan painted aft in large loopy letters. After he had finished gutting the day’s catch, he wandered the docks until he was sure no one was watching, then under pretense of loading a barrel of pickles onto the Dark Swan, Damian slipped aboard with nothing but a switchblade in his belt and the clothes on his back. He thought the diminishing land was the beginning of his adventure. Nothing happened for three days. Damian was sure his adventure was under way when the first mate’s angry face discovered him behind the barrels of sweet water three days into the journey. It turned out the captain was mostly drunk most of the time ever since his letters of marque had expired, and it was the first mate who was truly in charge on the Dark Swan. The reason the crew didn’t simply replace the captain is another story altogether, but it was the First Mate who judged Damian with narrowed eyes, and would ultimately decide upon his fate. Unbeknownst to Damian, the commonest punishment for stowaways was the deep six, but fortune or something greater smiled on him that day. One of the crew had suffered a stroke while swabbing the deck in the unforgiving sun. Damian was to replace the unlucky fellow, and was spared the lashes or something worse. It was shortly after this, on deck, when Damian noticed that the neutral colors had been replaced by a grinning skull on a black field. He grinned to himself. Now this was an adventure! Soon Damain was promoted to cabin boy, under the first mate no less, whose name incidentally was Lucky Limerick. A lot happened over the next short time which would qualify as a bona-fide adventure: slinking into port on false colors, the huge storm threatening to sink the ship as they bailed for their lives, or the standoff with another ship, a huge brig also flying the Jolly Roger. Cutlasses and boarding hooks were waved about and colorful threats shouted across the three feet of water between the ships. Only one man was injured, and it was only a shallow cut. At that exact moment everything went to hell, surely as if Davey Jones himself had surfaced. The Dark Swan rocked from side to side like a giant had picked it up and tried to shake out the little men within. Damian had a bare second to glimpse pure white sails and the King’s colors before he was thrown against the gunwale. He must not have been completely knocked out, because he managed to crawl away as the ship came to pieces around him. Through the sounds of whistling cannonballs, wood splintering and the screams of men, the strident ringing of the ships bell fixed itself in Damian’s mind. When it cut off suddenly, it seemed an ominous warning was given to those who were paying attention. A grinding sound from port made the Dark Swan shudder. All at once the ship lurched to a halt. Before he had time to further investigate, a high pitched whistle drew Damian’s eyes up. A black ball with a halo of orange fire grew bigger and bigger, transfixing him until it slammed into the ship and engulfed him. Damian came back to the world with a pounding headache, fuzzy vision, and so many different pains he wasn’t sure there was enough of him to hurt that much. When he tried to move, one pain came into sharp focus. He screamed until his own ears hurt, but the other pain didn’t diminish. Taking deep, short breaths, he forced his eyes open, clenched his teeth, and looked in the direction the of the pain. He wished he hadn’t. His left leg from the knee down wasn’t much of a leg anymore. He was going to throw up. He did so. Leaning back, wiping his face with his dirty sleeve Damian thought about home and his mother and father, not for the first time, but for the first time he thought he might not see them again. Tears streamed down his face, and he forgot his leg for a little while. He was sure he was not long for this world, and he could only continue to cry. However, Davey Jones did not come for him, and through the abating tears, Damian saw the shattered mainmast, skeletal without their sails. Black smoke swirled like ghosts. His leg impolitely reminded him it needed tending to. Damian choked back a sob and his eyes followed the smoke-ghosts as they fled for the skies. He made a decision. I will not become a ghost. He dried his eyes and looked around to see what he could possibly do. The Dark Swan was no longer a ship but the lost hope of one. Some parts were intact but more were missing. Fire gnawed at what little remained. The pink-gold reef under the ship gleamed though the shallow water. Through a gap in the prow, no doubt cleaved by a falling mast or a cannonball, a small strip of green gave a promise of continuing life. If I can reach it. The first thing to do is see if any of the jolly boats are still seaworthy, Damian told himself. He began to pull himself along the deck, wincing and grunting in pain. He made it two feet before he ran into a smoking corpse. A cutlass was clutched in fleshless fingers, and an old chest was cradled in the crook of its arm. Its boots were mostly unharmed, and from them Damian discovered the identiy of the dead man. It was Lucky Limerick. He died with his gold in hand. Through the tatters of the vest, glass glinted. 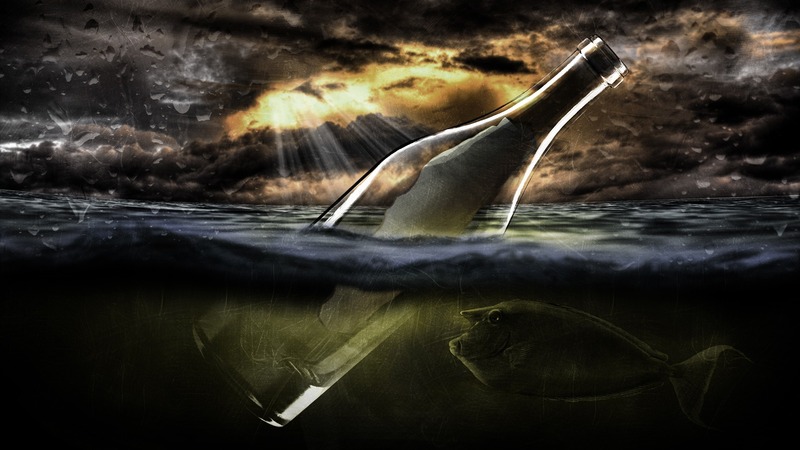 With a trembling hand, Damian pulled the bottle away from the dead man. He had seen the sailors pass others like it around. Uncapping it, he sniffed the strong fumes. Taking a tentative sip brought on a fit of coughing. It was the first rum he’d ever had. Damian took another swig from the bottle. The rum burned the whole way down but it reminded him he was alive, so he didn’t care. With immense effort, he dragged himself further up. The boat continued to burn around him, the sails nothing but ashes now. Her keel was fixed on the reef, but the tide was coming in and every wave threatened to pull the ship under. Damian took another swig, gritted his teeth, and swung his shattered leg over a gaping hole in the deck. Pain lanced up his whole body and he screamed, muffling the sound with his fist. The King’s ship had appeared as if by magic, right on their tail. They didn’t have a chance to turn before the cannons blasted through. He’d had been fortunate to be on deck at the time. No one below would have survived, certainly not after they were rammed into the reef. He looked down at his leg. In amongst the fire, the screaming, the explosions and the creaking of wood stressed passed its limits, he didn’t actually remember how he had gotten wounded. The bone was exposed, a grim little hyphen of white between his knee and his foot. Dear god, if he managed to get off this ship alive, he was probably going to lose the leg. He began to black out, his vision fading. It might have been his imagination playing delirious death-specters at him, but before darkness took him, Damian swore he heard an Irish lilt calling from somewhere nearby and yet very far off. Damian came to. He appeared to be floating on some sort of fluffy cloud, which made him want to cuddle into it and fall asleep. The cloud was rocking him back and forth, and now he just wanted to throw up. Rolling to the side, he did just that. A strong hand grabbed his shoulder and kept him from rolling out of the bunk. “Damian Cooke at your service,” Damian grunted as he tried to sit up, but the whole world swam under him. “What’s wrong with me?” Damian managed to get out, grabbing at the hand which was still steadying him. “Well, doc thought it would be better to keep you somewhat shall we say oblivious of your troubles until he could do something more permanent about your leg,” Killian explained. His leg. Right. It was probably going to come off. Damian tried to curse, but he couldn’t remember the words. He looked down. His leg had been swathed in bandages, but they didn’t look like they would hold long. The world started to swim. He looked up. Bright blue eyes and a face topped with black hair doubled and quadrupled over him. He thought the man was trying to offer him a reassuring smile. Damian never found out what what it was, because the ship shook violently, throwing both men to slam on the ceiling, and Damian was out again. The next time Damian came to, the bright blue sky was above him. His whole life was turning into a complete nightmare. All he had wanted to do was see the world and maybe impress some girls with tales of his adventure and pirating. This was nothing like what he had dreamed about or bargained for. He was going to throw up again. He hauled himself over and found himself staring at the sea lapping the side of a boat. It didn’t matter, it would do. He threw up again, and his head cleared somewhat. That came at a price. His leg began to throb again, which quickly grew into a burning pain. Damian looked around. Killian was in the dinghy with him, looking over his shoulder. Damian looked as well, and saw what could only be the arm of a squid encircling a ship. With a mighty crack then a sucking sound, the ship was pulled under. A few bubbles were its eulogy. “I must be bad luck,” Damian groaned. “How did we get off?” Damian wanted to know. Damian stared at him, wide-eyed and more than a little accusing, and Killian sighed. Damian sat at the bottom of the small boat, shivering with fright and fever as Killian leaned over him. Long moments passed. The chest and its mysterious contents taunted Damian. His leg felt as if it had swelled four times, and some monster with flaming teeth and acid saliva were devouring it. Damian was being suffocated by the firm grip, and he wrenched his head away. The man let him go, bright blue eyes fixed on the rolling water just off the port side. The ship and the kraken were gone. The sea was endless in all directions, until the sky swallowed it. Damian felt a twinge of unease by the vastness of the water, but Killian appeared unaffected. Killian did however, seem to have a problem with the water nearby. He held the chest to the middle of the small boat as he peered down, eyes narrowed. “We should be small enough to go unnoticed by that great yet very dumb beast,” Killian said, his gaze moving further away. “However, there’s more out there than you’d guess at first glance. And they’re coming for this.” The silver hook tapped the chest. At this point, Damian decided he really was just having a bad nightmare. Any moment now, he would wake up on the Dark Swan, a pile of rope an uncomfortable pillow under his head, and stumble away for his rations of beans or hardtack, and everything would be back to the way it was before. He pinched his arm. It hurt and he didn’t wake up. “This must be what hell is like,” Damian mused aloud. “Oh, this is no Hell. I’ve been there, and places a lot worse than that, mate,” Killian said with a grim smile. “There are places worse than hell?” Damian asked, incredulous. “I suppose you’ve traveled to many places, then?” Damian wanted to know. “I wouldn’t call it that, but to each his own,” Killian said, settling down in the boat, still keeping an eye on the water. His behind was going numb, and he shifted. Pins and needles lanced down his leg. It awakened the flaming monster devouring his leg and he made a sound between a cry and a whimper. Killian looked abashed, glanced down at the bandaged leg, and started talking to distract the younger man. “And you have this Sæspeira in that chest?” Damian asked. That didn’t sound so bad. Damian shifted, trying not to disturb his leg, which had stopped screaming and was only muttering now. Damian tried to give a brave smile, which came out more as a grimace. Killian nodded. They sat there in silence for a while, the water gently rocking the boat. Damian drifted on the hazy line between awareness and unconsciousness. He thought of his parents again, and almost started crying. Killian stood up suddenly. When Damian looked, the waves had gone flat as glass. A worried frown crossed Killian’s face. “What is it?” Damian asked, trying to sit up. “I believe we’re been found,” the other man said. Damian hated the fact that all they had was an old chest the old pirate wouldn’t open. The horrible thought that Killian was bluffing made the breath catch in his throat, and Damian welcomed the wave of pain from his leg which banished the thought. Clouds began to gather overhead, huge wheels of grey and black, spinning in a hypnotizing circle. The box was shoved into Damian’s hand. It was hard, and a lot heavier than it looked. How Killian could carry it under one arm was a mystery. The small boat rocked hard as the one-handed pirate dove off. He hit the water clean as a knife. For an instant he was visible through the water as he kicked down. Then he was gone. His jacket lay where he had stood, as did his boots. The clouds continued to gather above, casting the world into a premature twilight. Damian waited, hardly daring to breath, arms wrapped around the box for the protection he fancied it would give. He wondered if the Kraken came back if the protection would hold. A dangerous notion occurred to him. Springing from the same place as the idea to stowaway aboard a ship, this notion crept in slowly at first, like the warmth of a swallow of rum, then exploded in his head like fireworks. No, I shouldn’t, he told himself. Killian told me not to. If it’s really as powerful as he says it is…but then again he could be lying. Before he could do anything further, a woman appeared out of the water, rising on a cloud of silver seafoam. Damian was immediately struck with a mind-numbing terror. It could have been from the sparks of power flickering between her fingers, or the otherworldly predatory look in her eyes, or it could simply be the divine beauty of her face. Whatever it was, Damian became utterly speechless. Damian clutched the chest tighter, convinced he was to be torn to pieces any moment. A small part of Damian’s mind, which managed to retain some semblance of rationality in the face of this – god his mind whispered – powerful being, saved him. If this woman could take the box without asking, he reasoned, she would have. Which meant he had some leverage, as long as he did not let the chest go. Weakly, he shook his head. Thunder crossed the woman’s face, and the foam bubbling under her began to froth and hiss in agitation. “Then I will strike you down,” the woman hissed, her voice cold. Damian trembled, waiting for the death blow. It didn’t come. Instead a voice somewhere below and to his left spoke. It was a quiet voice, but it still startled him enough to almost soil himself. “She cannot, you know,” the voice said. Damian swallowed and looked down. Another woman had appeared, this one hanging over the side of the boat. Her arms were crossed and her chin rested on them. Her pale blonde hair was streaked with silver and fine lines crinkled at the corner of her eyes and mouth when she smiled. Very green eyes looked at the world with a patronizing amusement. A fishtail flipped in the water behind her. When she saw Damian staring at it, she splashing him in the face with a well-place flick of said tail. Damian coughed and spluttered, wiping salt water from his eyes. The mermaid laughed. “Who are you?” Damian asked for lack of something better to say. “Shows how much you know of the world,” Cytherea (or Aphrodite) sniffed. Neoteros rolled her eyes. They glittered in the murky light leaking through the clouds above, and Damian found himself becoming quite captivated. Aphrodite turned around, lowered herself with unconscious grace to the foam and sat with her back to them, not deigning to acknowledge their continued existence. Damian found it difficult to believe that, but he nodded dutifully anyway. Neoteros noticed the pale sheen to his face, the spots of fever in his cheeks, the growing tremor of his body. She cast her eyes skyward, either asking permission for something or wondering why she had to do things so obviously beneath her, then took a handful of water and blew gently across it. Typhoons and whirlpools danced across the surface, then the water fell still. Damian did so. The water was sweet on his tongue, not a hint of brine. The warmth reminded Damian of the rum, but it was gentler on his throat. Instantly, the pain in his leg faded, then disappeared altogether. The clean, fresh feeling, devoid of pain, made a tear leak from the corner of his eye. “Thank you,” Damian said, brushing the wetness away. He kept stealing sidelong glances at the beautiful creature in the water. The faint lines on her face and the silver in her hair made Damian think she was very old, but something else told him she was much older than she could ever look and he could ever understand. He was sure she was at least older than his parents. Neoteros caught one of his glances and favored him with a bright smile. He blushed and felt obligated to say something. Damian could see no difference, but he nodded once again. His glances began to be divided between the mermaid – or Oceanid, whatever that means, Damian thought, shivering when he realized he was much further out of his depth than he’d thought before – and the cold woman on the foam cloud. “What is she doing?” Damian asked when Aphrodite’s stillness began to fray on his already frayed nerves. “For you to let your guard down so she can get what she wants,” Neoteros explained. “What does she want?” Damian gulped. Her fishtail flicked just under the water, sending ripples out, and she frowned as she considered. “In the beginning, the universe was ruled by Gaia, Mother Earth, and Uranus, Father Sky. The had twelve children, the Titans. One of the Titans named Cronus overthrew his father and ruled during the Golden Age of the world. In his turn, he was defeated by his children, the Olympians. In order to defeat the Titans, the Olympians bade their cousins the Cyclops, fearsome one-eyed giant craftsmen, to create three powerful weapons: a thunderbolt for Zeus, a helmet for Hades, and a trident for Poseidon. After their victory, these Olympians oft fought among themselves, most notably the three most powerful, the brothers Zeus, Hades, and Poseidon. One story tells of Zeus and Hades combining their powers to trap Poseidon in the terrible realm of Tartarus and stealing his trident. But Poseidon was canny and had prepared for such a betrayal. In secret he had the Cyclops make him a protection against the weapons of the gods, known as Sæspeira, or the Spirit of the Sea. Using it one could render any weapon or army impotent, making it a more powerful weapon than any other. It was hidden in a magnificent shell and given to Triton, Poseidon’s son. Zeus and Hades thought nothing of it when Triton blew into it, for they were more powerful than the son of Poseidon. But when Sæspeira sang, Zeus and Hades were stripped momentarily of their power, allowing Poseidon to escape. After Poseidon was freed, he retrieved his trident and struck the water with tremendous anger, causing a huge earthquake. The ground shook and split, and a crack opened up beneath Triton. In his effort to save himself, Triton let go of Sæspeira, and it fell from his grasp through a portal to another world. “Should I open it?” Damian was compelled to ask. “What fuss?” Damian said, feeling horribly lost in the growing confusion of whatever it was he had gotten mixed up in. “Well, some landborn fool who thinks he knows anything about the sea is trying to see Poseidon about his treasure,” Neoteros shook her head with a weary sigh. “Fool,” she iterated. That would be Killian, Damian thought. “What happened to him?” he asked timidly. Just then a familiar head popped out of the water. Speak of the devil Damian thought but did not say, fearing to invoke the name. Killian took a deep gulping breath, saw the two woman hanging over Damian and promptly began choking. He went under, and shot out of the water again. At his voice, Aphrodite turned around. Her eyes brightened, and her red lips pulled back in a hungry smile. Before anyone of them could move, she appeared over the man, reached down and plucked him out of the water like she might pluck a flower in a meadow. “Perhaps you would like to make a trade?” she said, an ingenuous expression on her face as she looked at Damian. Killian started to struggle, but the woman was much stronger than she looked. She wrapped him in porcelain arms, pinning his arms to his side and no matter how he tried, Killian could not break her hold. “Don’t give it to her, Damian!” he cried out. “I will end your meddling friend if you do not hand over Sæspeira,” Aphrodite said. “Don’t you dare!” Killian shouted even louder, increasing his efforts to break free. Though he could not move much, he managed to gouge the woman in the thigh with his hook. A single tear of bright red blood ran down her leg. Aphrodite showed no sign she felt pain, but a terrible anger made her eyes turn black. Killian began gaping and moving his mouth, but no sound came out. Damian could read his lips easily enough. He just repeated the same thing, blue eyes blazing as he kept fighting with pigheaded stubbornness. “What are you going to do?” a low voice said. Damian looked down. He had forgotten Neoteros was still there. “What should I do?” Damian whispered. Damian didn’t like either of those options, but what choice did he have? They couldn’t stay like this forever. Actually, he amended. Neoteros and Aphrodite probably could. That made up his mind. His hand twitched towards the tarnished bronze catch of the chest. “No!” Killian’s anguished shout rose above the crashing waves. Damian hesitated, fingers poised to throw open the chest. He swallowed, and prayed to god he wasn’t making the second biggest mistake of his life. He realized in a detached way that the god he was praying to was most likely Poseidon himself. The thought came too late to stop or change Damian’s course of action. The chest opened, and nothing happened. 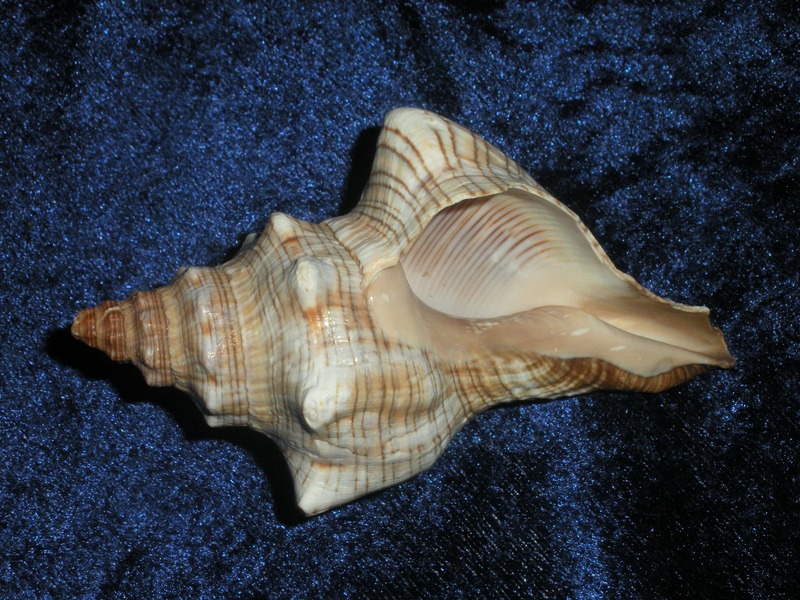 A large, pink-silver shell, a slender spiral widening and curving, pearly highlights glittering in the light, held almost everyone transfixed for different reasons. Neoteros could have been looking at a pile of rotting driftwood for all the interest she displayed. Killian gazed at Damian, eyes wide, speechless. Damian’s hand crept towards the fabled Sæspeira. With a cry, Aphrodite dropped the dripping Killian, and lunged for Sæspeira. Damian was frozen. Dimly, Killian’s enraged cries interspersed with furious splashing and a voice saying use it, you fool, use it before she claims it! impinged on the part of Damian’s conciseness which managed to remain lucid. However, his body had become completely disconnected from this intelligence and he could only watch, mouth ajar as the goddess came straight fro him. Her eyes blazed, her lips pulled apart in a joyous snarl. Pale fingers were a hair’s breadth from Damian’s throat when the world jolted. Aphrodite was pulled back like a puppet on a string. All of Damian’s discombobulated pieces came crashing together and he utter a strangled yelp. His fingers groped for Sæspeira. They came away empty. Panicked, Damian looked down. The silver shell had disappeared. “Easy dearest cousin,” Neoteros said. The mermaid – Oceanid, Damian corrected himself again – floated or her back. In her hands was Sæspeira, and she stroked it with unconscious gestures, her eyes fixed on Aphrodite. The goddess had deflated like sails in a calm. She appeared to be no more than a beautiful woman, an unusually beautiful woman, but just a woman nonetheless. A bewildered expression made her look very young. “Do not speak,” Neoteros commanded. Slowly, her distant gaze traveled to Killian, who tried to remain afloat without moving. She raised a finger and pointed at him. “No!” Damian cried, trying to leap out of the boat. Neoteros’ green eyes flicked to him, her amused spark surfacing for a instant before it was submerged in that weird ethereal glow. Damian understood with implicit certainty he was looking not at Neoteros but at Sæspeira itself. His leg still wouldn’t support his weight, and he flopped over the side of the boat, wood cutting into his ribs. A flash of light blinded him, then he was standing in the boat next to Killian. Killian was completely dry and blinking rapidly. It took a moment for the fact that Damian was standing on his own two feet to sink in. His leg had reappeared, whole and unmarred. Such magic was so preposterous, for a moment Damian wished his injury back just so the world would still make a little sense. He gasped and felt sick, and leaned towards Killian, who caught him and propped him up. “I think we already have,” Damian whispered back. The two morals stared at the two very ancient beings staring each other down. Killian was tense, poised to leap into action, though what that would do, Damian wasn’t sure. Then the one-handed man launched himself at Neoteros. He fell into the water just short of her, sending a sheet of water cascading over her. The Oceanid was startled, and again the glaze fell from her eyes. Her body jerked and Sæspeira tumbled from her grasp into the water. It sank from sight. Immediately Aphrodite was released from the invisible bonds restraining her. She wasted not a second and dove into the water after Sæspeira. Killian cursed and followed her. Neoteros paused and spared a glance at Damian. Damian was too discombobulated to appreciate the insult in her rebuke. Neoteros waved a slender hand in his direction. A wave of sparkling light reminiscent of water rolled over Damian, and the last thing he saw was a sleek fishtail disappearing into the deep. Then he was tumbling head over heels, carried along by an elemental force which dumped him unceremoniously into blackness. Light filtered into Damian’s eyes. When he tried to open them, they were crusted shut. He rubbed at them for a moment and then was able to gaze at the bleary world. He was on the dock, sandwiched between a crate and a barrel against a cold, stone wall. The sun was peeking over the horizon, a shy, rosy glow. Already sea-dogs and wharf-rats swarmed over the rough cut planks. Noise grew in Damian’s ears, the whisper of the waves lapping against the breakwall, the squawks of gulls, the creaks of ships and sails, and the shouts of men. Damian stood with difficulty. He felt weak, and the shadow of a headache thudded between his ears. A sour taste in his mouth suggested he had been throwing up. He thought maybe he had been drunk. “Da’s going to kill me,” he muttered, and turned a little too quickly on his heel. Reeling, he grabbed for the stone wall and with less haste began to make his way home. Try as he might, he could not recall what had transpired between tossing the last of the previous days catch, boned and gutted into the crate, and waking up this morning. When he got home, his mother scolded him for being late for breakfast. His father had already left for the day. Damian was punished by having to mend all the nets piled in the skiff shed. He sat on the dock, salt-heavy air ruffling his hair. Around midday Damian looked up to see an old snow flying neutral colors coming into the dock. The name Dark Swan was painted aft in looping letters. He felt a twinge of something, longing perhaps, perhaps something else. Then he dismissed it and went back to pulling the twine over and through, tying it off and repeating. If he often dreamed of pirate ships, beautiful mermaids, and a man with a silver hook in place of his left hand, he did not remember it. If, in later years when his hair had turned white and his teeth had mostly gone, the lower part of Damian’s leg muttered with phantom forgotten pain, he would write it off to bad weather. Yesterday the Ink Slingers got together again. We had tea and a wonderful time with many laughs, which was appreciated by all as it seemed to be “one of those weeks”. I got almost nothing done writing-wise the last two weeks, so there went my conquests (and I started out the year with such a good streak!). I did however accomplish a few things, including reading Stephen King’s It, which had been moved to the top of my reading list by recommendation of the Committee of Recommended Books. Apart from the Dark Tower series, I don’t usually read Stephen King, because horror is not my thing. However, I found It to be within acceptable horror parameters and quite enjoyed it. I still will not be seeing the movie. There are some things I cannot be talked into. I did receive exciting news from my lovely editor: I should get the edits back on Ria’s Mark in a week or so!! So that’s coming along well. I shall keep everyone updated as to pre-orders, giveaways, and release dates as those become known. dance (my word), flutter, circus. “That was, um, delightful,” she managed to get out without choking on the words. girl was on the verge of tears. And she had every right to be. What they were doing was not to be taken lightly. but it could save lives. A cacophony of wails erupted, a Mirelda winced. “That’s not going to work either,” she yelled over the noise. The girls quieted to whimpers. her face streaked with tears. bigger on the inside, and messier as well. cleaning an odd vase with a rag that was dirtier than the vase. “No, I… ” Something caught Melly’s eye. “What is that?” she asked, her eyes fixed on it. Posted in Guardians of the Path, Ink Slingers Guild, Magyc, Writing and tagged #amwriting, #amwritingfantasy, authors, awesome, books, Bottle, ceremony, demon, DragonBeck, editing, editor, edits, elvish, fantasy, flash fiction, for your reading pleasure, giftcard, good news, GOTP, Guardians of the Path, Ink Slingers Guild, ISG, It, J. R. R. Tolkien, magic, Nicole DragonBeck, promise, reading, Ria's Mark, sacrifice, sci-fi/fantasy, short stories, Silmarillion, Stephen King, Tenna' ento lye omenta, The Children of Hurin, Tolkien, writer, writers, writers meeting, writerslife, writing, writing exercises on March 3, 2016 by DragonBeck.